1) The Community Security Trust has published its Antisemitic Incidents Report for 2018. 2) At the Washington Examiner, David May and Jonathan Schanzer ask “Why has Human Rights Watch become an anti-Israel activist group?”. 3) Jonathan Spyer takes a look at “Iran’s Strategy for Control of Syria”. 4) The ITIC analyses Hamas’ latest fundraising efforts. 1) The CST has produced a research briefing documenting the reactions of various UK-based groups to the death of the “blind Sheikh”, Omar Abdel Rahman, in prison in the US. One of those groups is ‘Cage’, which two years ago received considerable promotion on BBC platforms. Asim Qureshi of ‘Cage’ has also been interviewed on BBC programmes without his “particular viewpoint” having being clarified to audiences. The full CST briefing can be found here. 2) The Telegraph has an interview with the chairman of the Charity Commission for England and Wales. “Reports of alleged links between charities and terrorism or extremism have surged to a record high, the charity watchdog has warned. The number of times the Charity Commission has shared concerns about links between charities and extremism with police and other agencies has nearly trebled from 234 to 630 in just three years. Earlier this year the Commission stepped in to stop the Joseph Rowntree Charitable Trust and Anita Roddick Foundation funding Cage because it did not match their “charitable objectives”. Mr Shawcross said that Cage, a controversial human rights group, “was not a charity and there is no way in which Cage could represent any charitable purpose under British law”. 3) As explained by Dr Matthew Levitt in a briefing last month to the Senate of Canada, the abuse of charities is of course by no means confined to the UK. 4) As has been noted here on numerous occasions in the past, when reporting on the Boycott, Divestment and Sanctions (BDS) campaign against Israel, the BBC consistently refrains from informing its audiences what that campaign aims to achieve and in August 2015, we learned that the BBC considers the provision of such background information “not our role“. Our colleagues at UK Media Watch have posted a short video explaining the BDS campaign. The Community Security Trust (CST) recently published its annual report (available here) on the topic of Antisemitic Discourse in Britain for the year 2015. “Many critics though of Israel’s policy would suggest that the Palestinians suffer hugely at Jewish hands as well”. “…Of course, Willcox would never say such a thing after the murder of Muslims, and rightly so. He was interviewing an elderly Jewish lady, who was trying to mourn Jews killed for no other reason than they were Jews in a Paris supermarket. Readers will no doubt recall that in response to complaints concerning that broadcast, the BBC originally claimed that Willcox’s subsequent apology on Twitter sufficed. Having received a large number of complaints, the BBC then decided to consolidate them. Concurrently, additional complaints made to OFCOM were rejected. In February 2015 the BBC’s Editorial Complaints Unit provisionally rejected the consolidated complaint, sparking condemnation from the Board of Deputies of British Jews. In May 2015 the ECU finalised its decision. In June 2016 the BBC Trust’s Editorial Standards Committee published its rejection of appeals against that decision. As OFCOM prepares to take on its new role as final adjudicator of complaints concerning BBC content, this worrying example once again highlights the need for both it and the BBC to work according to the definition of antisemitism recently adopted by the British government. Our sister site UK Media Watch has a very interesting interview with the CST’s Dave Rich – author of the new and very timely book ‘The Left’s Jewish Problem’. UKMW: In the first chapter of your book, ‘When the Left Stopped Loving Israel’, you argued that the rise of anti-imperialism and anti-colonialism as the defining ideologies of the radical left influenced activists to see the Israeli-Arab conflict through a different lens. Is it a fair reading of this chapter to say that, contrary to most theories, this left-wing intellectual tide began to turn before the Six Day War – that is, before Israel occupied one square centimeter of land? Dave Rich: Yes, this is correct, although – and this is the key point – the radical left argument was, and remains, that Israel’s occupation of Palestinian land began in 1948 (or before), and 1967 was just an extension of that earlier ‘crime’. The Six Day War saw an outburst of anti-Zionism on the radical Left in several countries, but the political ideas fuelling that outburst were already visible in the decade prior to that war. In Britain, anti-colonialism had become a prominent liberal and left-wing cause during the 1950s as colonies gained independence, and the Suez Crisis exposed the shabby duplicity required to maintain Britain’s imperial interests. The idea that Israel was a legacy of Western colonialism, rather than a rejection of it as many leftists had believed in 1948, was increasingly heard in radical left-wing politics in the early 1960s. So when the Six Day War occurred it was, as one contemporary observer wrote, “the perfect example of the key event as orchestrator of a symphony which was ready to be played.” The war gave focus and energy to ideas that already existed: this is why the radical left-wing response in the years following 1967 was not limited to analysing that war and its consequences, but instead critiqued the circumstances of Israel’s creation and the ideology of Zionism itself. People began to see Israel as a settler state, comparable to South Africa and Rhodesia – all three of which were former British colonies, so the theory had particular purchase in Britain. The eruption of further scandals concerning members of the UK Labour party last week prompted extensive coverage of the story on all the BBC’s various platforms, with some items purporting to explain to the corporation’s audiences the difference between antisemitism and anti-Zionism. One such written backgrounder was previously discussed here and another item with the same theme appeared (from 01:48:00 here) in the April 30th edition of BBC Radio 4’s ‘Today’ programme. The programme Webb appears to be referring to can be found here at 01:36:05. He of course refrains from informing listeners that according to the definition of antisemitism used by the All Party Parliamentary Group Against Antisemitism and the College of Policing, “[d]enying the Jewish people their right to self-determination” is indeed considered antisemitism. Webb then once again floats the notion that Israel is to blame for antisemitism. However, Bowen’s portrayal of the CST’s statement is not accurate and it materially misleads listeners. The CST did not say – as Bowen claims – that the vote in the House of Commons “stoked antisemitism in Britain”. What it did say in its report on Antisemitic Discourse in Britain in 2014 (see page 33 onwards) was that some of the language used in the debate surrounding that vote employed antisemitic themes. Seeing as some of that antisemitic discourse took place on the very same BBC radio station to which Bowen is speaking in this item, one might have expected him to be more au fait with the story – and to be able to portray it accurately. The item closes with Bowen’s appraisal of the Palestinian view of the story – although listeners are not told why the BBC considers that view to be relevant. We do however learn that the BBC does in fact know that the Arabic word ‘Yahud’ does not mean ‘Israeli’ and – despite the fact that the issue is never raised in BBC content – that the corporation is aware of the existence of antisemitism in Palestinian society. The item closes there with Bowen making no effort to inform listeners that antisemitism and persecution of Jewish communities in the Arab world existed long before Israel – and political Zionism – came on the scene. Did listeners go away with a better understanding of antisemitism and anti-Zionism? That is extremely doubtful but what is obvious yet again is that the BBC will remain incapable of adequately explaining this subject to its audiences so long as it fails to work according to accepted definitions of antisemitism. A complaint concerning a BBC programme which was flagged up in the CST’s report on Antisemitic Discourse in Britain in 2014 has been rejected by the BBC Trust’s Editorial Standards Committee. The ESC’s full decision can be found on pages 17 to 23 inclusive here with a summary appearing on pages 6 and 7. Whilst the full text of the original complaint is not available, some of the content of the decision appears – to put it politely – to have missed the point. The real significance of this ruling, however, is found in the fact that the BBC Trust’s Editorial Standards Committee obviously considers itself to have sufficient authority, knowledge and expertise to determine what is – or in this case, what is not – antisemitism even though one of Britain’s leading expert bodies on that form of racism has classified the programme concerned as an example of antisemitic discourse. The Community Security Trust (CST) recently published its annual report on the topic of Antisemitic Discourse in Britain for the year 2014. Readers of the report – which can be found in pdf format here – will note a reference to a BBC programme from November 2014 on page 35 under the heading “BBC DISCUSSION – JEWISH DONORS, JEWISH LOBBY, MANSION TAX”. A link to the broadcast concerned is available here. Discussion of that programme can be found in the BBC Watch article titled “More BBC promotion of the ‘Jewish lobby’ trope” and information regarding the BBC’s response to criticism of the broadcast is available in the subsequent article “BBC doubles down on presenter’s ‘mansion tax’ comment“. With BBC content reaching the vast majority of the UK population and BBC One television news identified by the public as the UK’s most important source of news, the manner in which the BBC reported a story which prompted twenty-two antisemitic incidents in that country is obviously of interest. Here at BBC Watch we have been tracking the BBC’s reporting of that particular story since it first emerged. On July 30th 2014 we noted that – despite information having been provided around an hour after the incidents at Shifa hospital and the Shati refugee camp occurred which showed that the cause of the civilian casualties was missiles fired by a terrorist organization – the BBC’s reporting of the story on July 28th and 29th promoted the Hamas version of the story according to which Israeli missile strikes caused the deaths of some eight children and several adults. 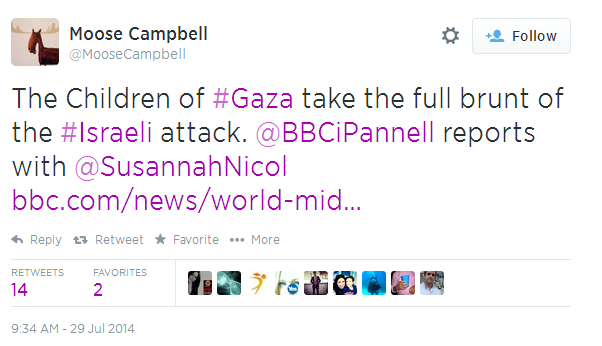 Several days later we noted here that the BBC had produced a report on July 31st (updated on August 4th) titled “Gaza conflict: Disputed deadly incidents” which – despite the above-mentioned information – continued to encourage audiences to believe that Hamas’ version of the story was at least as credible as the information provided by Israel. ‘The BBC’s presentation of that incident, however, places data gathered from sophisticated tracking equipment on a par with the unverified verbal claims of assorted bodies all ultimately run by a proscribed terrorist organization. 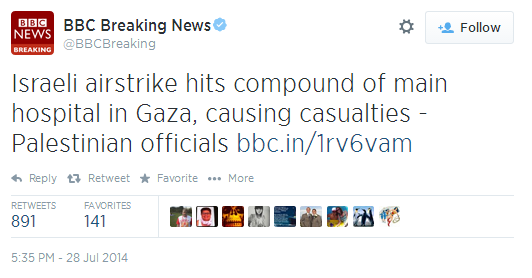 “Gaza’s police, Civil Defence Directorate and health officials say Israeli air strikes caused the explosions. According to Al-Jazeera, Hamas denied it had fired any rockets from the area and said it was “categorically an Israeli air strike”. Hamas said it had collected shrapnel from the scene consistent with Israeli munitions, the channel’s website reported. On August 12th 2014 we noted that – despite a visit by the BBC’s chief international correspondent to an IDF missile tracking unit – the article defining the July 28th incident as “disputed” still stood. On December 12th 2014 we noted that the IDF Military Attorney General’s investigation into the July 28th incidents at Shifa hospital and Shati concluded that they were caused by missiles fired by a terrorist organization. 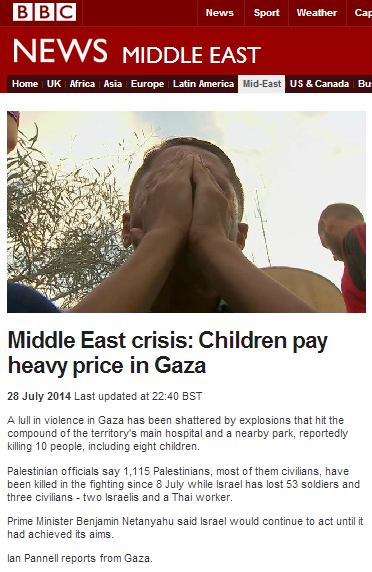 Despite that, all the five reports suggesting to BBC audiences that it was reasonable to assume that the deaths of civilians – mostly children – had been caused by Israeli missiles were still available to visitors to the BBC News website with no correction added. 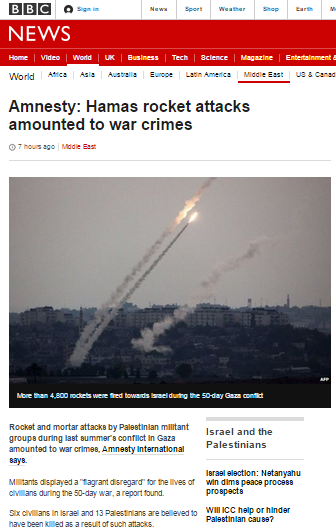 “Amnesty said rocket fire had also endangered Palestinian civilians. The corporation’s continued failure to add appropriate clarifications to those five BBC reports (and any others still available to the public) risks wasting licence fee payer-provided funding on dealing with unnecessary complaints. More seriously, it also continues to provide the agar for antisemitic incidents in Britain. The Community Security Trust (CST) recently published a report titled ‘Antisemitic Discourse in Britain in 2012’. On page 20 of that report, under the chapter heading “Jewish conspiracy and the ‘lobby'”, the CST cites an edition of the BBC programme ‘Hardtalk’ from May 2012 as an example of the propagation of the age-old concept of the supposed power of an American ‘Jewish lobby’. It should of course be a sad day for the BBC – as well as a wake-up call – when it finds itself among such company as the Iranian regime’s Press TV and known Hamas supporters such as MEMO in a report by Britain’s leading authority on antisemitism.